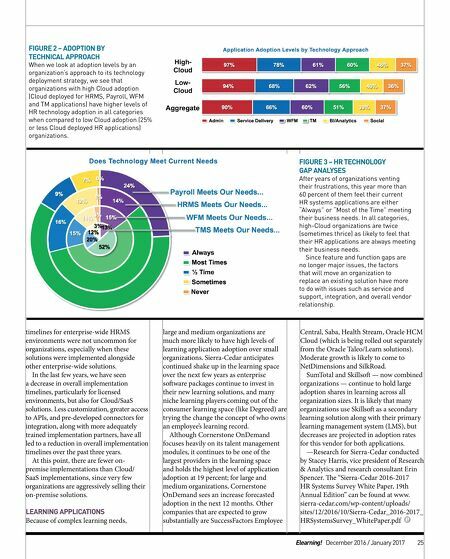 2017 HR technology trends 24 December 2016 / January 2017 Elearning! Cloud-based technologies also allow organizations to develop more valuable relationships with their workforces, clearly defining their expectations and the employee value proposition in a tailored employee experience. TECHNOLOGY: Now that there has been a shift both from vendors and buyers toward Cloud/SaaS HR solutions, foundational technology questions are refocusing. 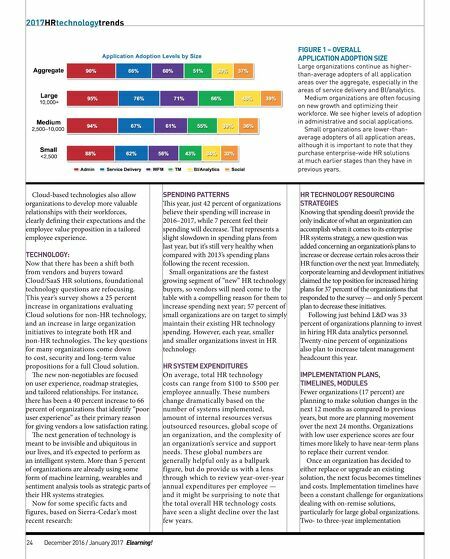 This year's survey shows a 25 percent increase in organizations evaluating Cloud solutions for non-HR technology, and an increase in large organization initiatives to integrate both HR and non-HR technologies. The key questions for many organizations come down to cost, security and long-term value propositions for a full Cloud solution. e new non-negotiables are focused on user experience, roadmap strategies, and tailored relationships. For instance, there has been a 40 percent increase to 66 percent of organizations that identify "poor user experience" as their primary reason for giving vendors a low satisfaction rating. e next generation of technology is meant to be invisible and ubiquitous in our lives, and it's expected to perform as an intelligent system. More than 5 percent of organizations are already using some form of machine learning, wearables and sentiment analysis tools as strategic parts of their HR systems strategies. Now for some specific facts and figures, based on Sierra-Cedar's most recent research: SPENDING PATTERNS is year, just 42 percent of organizations believe their spending will increase in 2016–2017, while 7 percent feel their spending will decrease. at represents a slight slowdown in spending plans from last year, but it's still very healthy when compared with 2013's spending plans following the recent recession. Small organizations are the fastest growing segment of "new" HR technology buyers, so vendors will need come to the table with a compelling reason for them to increase spending next year; 57 percent of small organizations are on target to simply maintain their existing HR technology spending. However, each year, smaller and smaller organizations invest in HR technology. HR SYSTEM EXPENDITURES On average, total HR technology costs can range from $100 to $500 per employee annually. These numbers change dramatically based on the number of systems implemented, amount of internal resources versus outsourced resources, global scope of an organization, and the complexity of an organization's service and support needs. These global numbers are generally helpful only as a ballpark figure, but do provide us with a lens through which to review year-over-year annual expenditures per employee — and it might be surprising to note that the total overall HR technology costs have seen a slight decline over the last few years. HR TECHNOLOGY RESOURCING STRATEGIES Knowing that spending doesn't provide the only indicator of what an organization can accomplish when it comes to its enterprise HR systems strategy, a new question was added concerning an organization's plans to increase or decrease certain roles across their HR function over the next year. Immediately, corporate learning and development initiatives claimed the top position for increased hiring plans for 37 percent of the organizations that responded to the survey — and only 5 percent plan to decrease these initiatives. Following just behind L&D was 33 percent of organizations planning to invest in hiring HR data analytics personnel. Twenty-nine percent of organizations also plan to increase talent management headcount this year. IMPLEMENTATION PLANS, TIMELINES, MODULES Fewer organizations (17 percent) are planning to make solution changes in the next 12 months as compared to previous years, but more are planning movement over the next 24 months. Organizations with low user experience scores are four times more likely to have near-term plans to replace their current vendor. Once an organization has decided to either replace or upgrade an existing solution, the next focus becomes timelines and costs. Implementation timelines have been a constant challenge for organizations dealing with on-remise solutions, particularly for large global organizations. Two- to three-year implementation FIGURE 1 – OVERALL APPLICATION ADOPTION SIZE Large organizations continue as higher- than-average adopters of all application areas over the aggregate, especially in the areas of service delivery and BI/analytics. Medium organizations are often focusing on new growth and optimizing their workforce. We see higher levels of adoption in administrative and social applications. Small organizations are lower-than- average adopters of all application areas, although it is important to note that they purchase enterprise-wide HR solutions at much earlier stages than they have in previous years.